Today, I was comfort cooking. And desperate for more of that belly pork from Bobby Chinn’s House of Ho. Unfortunately for me, London is an hour and a half away from train and I wasn’t particularly feeling well. 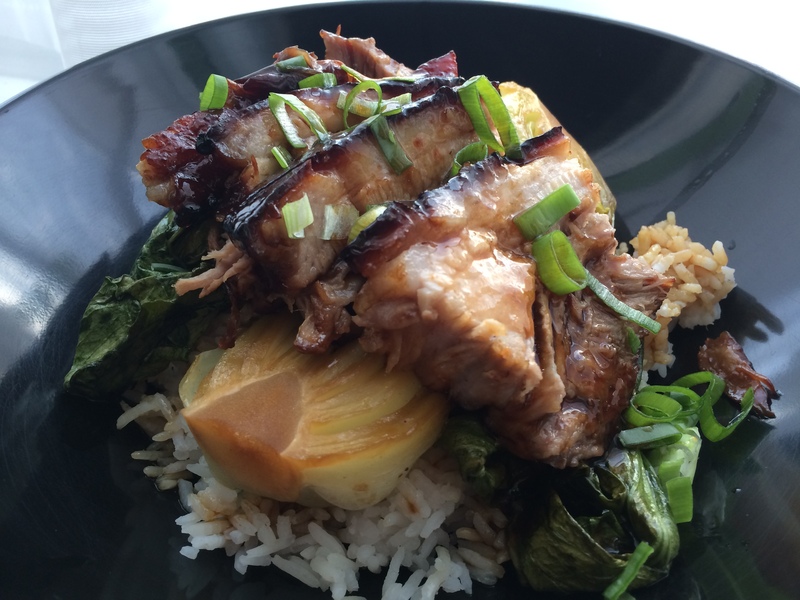 So I did the next best thing: cook my mom’s braised pork – and add a few tweaks of my own. Score the belly pork rind. 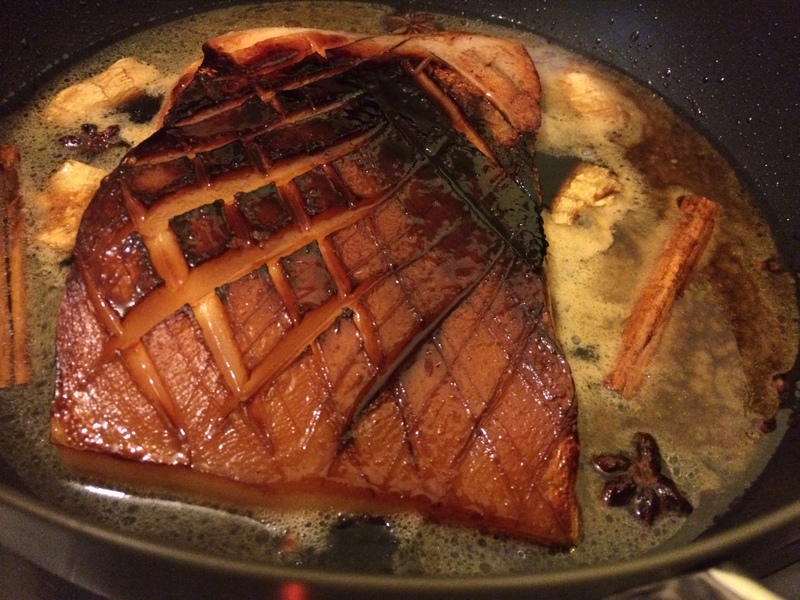 In a work or a deep sauce pan, heat up oil and add about 50g of sugar and slowly caramelise the sugar in the oi Once the sugar has completely melted and has turned a brown caramelly colour, raise the heat to medium and lay the pork belly skin-side down down and allow to colour for about 3 minutes. Turn to do the fleshy side for another 3 minutes. Fill the pan until with enough water to cover the pork. Add the soy sauce, ginger, cinnamon, star anise, cloves and rice wine. Preheat the oven to 200°C. Pass the braising liquid through a sieve. To the braising liquid add 1 heaped tbsp of cornflour (don’t add the cornflour directly to the hot liquid – dissolve it first in about 3 tablespoons of water) and stir over low heat and allow to thicken. Pour half of the thickened braising liquid over the pork and roast in the oven for 30 minutes. After roasting, take the pork out of the oven and allow to rest for 10 minutes before slicing to serve. Serve with chopped spring onions sprinkled over the pork slices. This is best served with rice or hirata buns The left over thickened sauce can be a dipping sauce for the buns or sauce for the rice.